The New York Jets of the American Football League and later, the National Football League played at Shea for twenty seasons, from 1964 to 1983 (excluding their first home game in 1977 played at Giants Stadium). 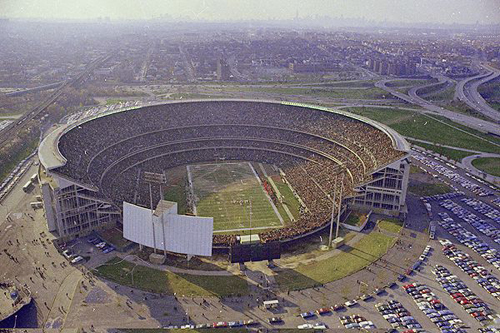 The stadium hosted three Jets playoff games: the American Football League Championship in 1968 (beat the Oakland Raiders, 27-23), an AFL Divisional Playoff in 1969 (lost 13-6 to the Kansas City Chiefs) and the 1981 AFC Wild Card Playoff game (lost 31-27 to the Buffalo Bills). For most of the Jets' tenure at Shea, they were burdened by onerous lease terms imposed at the insistence of the Mets. Until 1978, the Jets could not play their first home game until the Mets' season was finished. Even after that year, the Mets' status as Shea's primary tenants would require the Jets to go on long road trips (switching Shea from baseball to football configuration was a rather complex process, involving electrical, plumbing, field and other similar work). The stadium was also not well maintained in the 1970s. The Jets moved to Giants Stadium for the 1984 season, enticed by the additional 15,000+ seats offered there. Fans ripped Shea apart after the last game of the 1983 season. Even the scoreboard operator had a field day, displaying the home team as the "N.J. Jets". It was at Shea Stadium in 1973 that O.J. Simpson became the first running back to gain 2,000 yards in a single season (and, to date, the only player to do it in 14 games or fewer). The Jets' final game at Shea was a 34-7 loss to the Pittsburgh Steelers on December 10, 1983. The game marked the final appearance of Pro Football Hall of Fame quarterback Terry Bradshaw, who was 5-of-8 for 77 yards and two touchdowns during his brief stint. Earlier in the 1983 season, a Jets game against the Los Angeles Rams featured an 85-yard touchdown run by rookie Eric Dickerson, as well as a brawl between Rams offensive tackle Jackie Slater and Jets defensive end Mark Gastineau when Slater blindsided Gastineau after the Jet performed his infamous "Sack Dance" over fallen Rams quarterback Vince Ferragamo. 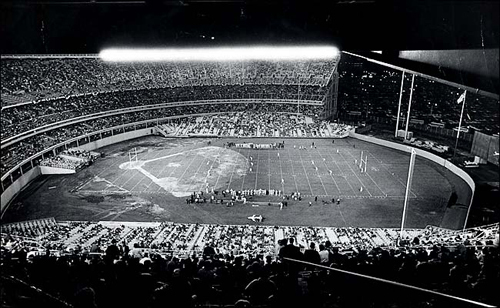 The NFL's New York Giants played their 1975 season at Shea while Giants Stadium was being built. The Giants were 5-9 that year (2-5 at Shea). Their coach was Bill Arnsparger and their quarterback was Craig Morton. The football field at Shea extended from around home plate all the way to the outfield, with the baseline seating rotating out to fill left and right fields. The stadium was often criticized by baseball purists for many reasons, even though it was retrofitted to be a baseball-only stadium after the Jets left. The upper deck was one of the highest in the majors. The lower boxes were farther from the field than similar seats in other parks because they were still on the rails that swiveled the boxes into position for football. Outfield seating was always rather sparse, in part because the stadium was intended to be fully enclosed.